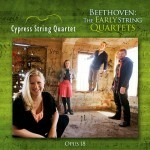 The Cypress String Quartet completes their cycle of the genre’s greatest oeuvre with a two-album set of Beethoven’s six ground-breaking quartets, Op. 18, alongside a reissue of their previously self-released recording of the late quartets. 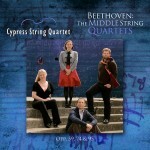 For the past several seasons, the Cypresses have immersed themselves in performing Beethoven on tours throughout the United States and Europe as well as recording all 16 works plus the “Grande Fugue” (Große Fuge). 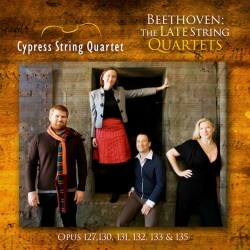 The completion of their Beethoven cycle is a fitting celebration of the Bay Area-based ensemble’s 20th anniversary as well as their valedictory season: their final performance will take place in June 2016, preceded by a month-long Beethoven celebration performing all of the quartets throughouut the city of San Francisco.